The best gamepad out there! First of all, I'd like to say that this gamepad beats all other gamepads. I did about two straight weeks of reasearch for this gamepad and even tested it in stores. I think that it is a lot better than any of the Microsoft gamepads because the great D-pad. What I like about the D-pad better than Microsoft's D-pad is that it is a lot bigger and easier to move because it is like a big joystick. I would also like to say that the Precision function is great for shotting games for targetting. Last of all, I found the gamepad was a lot more comfortable than Microsoft's and other brands of gamepads. It gave me a nice grip too. Also the buttons are pretty easy to reach, accept for the four action buttons which were a little far appart, but I didn't think I should take away a star for that. Well, anyway, I highly recomend this gamepad for anyone who really want's to do well in their games. I bought the Eliminator shortly after buying the basic GamePad Pro (the white Playstation-esque controller) so that I could play two player games with my friends. In most areas, the Eliminator outshines its humbler, plainer counterpart, albeit for a hefty price. 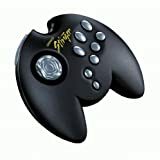 To begin with, the Eliminator's directional control is capable of functioning as an analog pad, which is a definite plus for 3D games like Evil Twin. But it can revert to digital 8-way mode via its "Precision" button (which, unfortunately, cannot be configured to have any other use). As an analog pad, the Eliminator performs admirably, with smooth movement and no significant problems. As a digital pad, it is a tad awkward because of its smooth, ball-and-socket feel. But it works perfectly well. One gripe I have with the controller is that it only has ten buttons (same as the GPP), but it costs a lot more than the GamePad Pro. Also, although it looks a lot cooler, its supposedly ergonomic shape does not actually make it feel any more natural to use than any other controller. If you are considering the Eliminator, ask yourself this question: do I really need an analog pad? (Hint - if you play 3D platformers on your computer, you do.) If you don't, then go with the white GamePad Pro instead. It may not look as slick, but it's a much better value. If you do, on the other hand, the Eliminator is a solid choice that won't let you down. When I saw it in the store, I held it on the display to see if it was good. It felt great, I liked how the buttons were situated. But if you have Windows 2000 or Windows XP, the software you have to use is only available on the Gravis site, and is only in Beta form. But thats not the bad part about it. I use the pad for no more than a couple days, and it no longer wants to move up or down. I figure its a driver problem, so I uninstall and reinstall the software package. Still no go. Be very careful with the directional pads on this gamepad and any ones with a similar rounded directional pad, as they are very cheaply manufactured and break easily. If I could, I would have returned it, but it was a sale item. It has a three year warranty, but the way I play games with it, I really don't want to have to keep sending the gamepad back every couple weeks to get fixed. 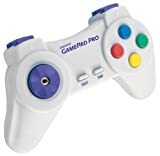 You are better off with the normal Gamepad Pro or Gamepad Pro USB, that looks like a Playstation or PS2 controller, as it has a better directional pad (it isn't the rounded type). I bought a Gravis Gamepad Pro about 7-8 years ago and it is still going strong to this day. My 6 year old and I have been playing Wakeboarding unleashed and knew we needed another gamepad. So this past weekend I bought the Gravis Eliminator Gamepad Pro. Unfortunately, I cannot calibrate it correctly. It keeps wandering to the left or right. When i called Gravis and asked, the lady with the foreign accent at tech support tried telling me that it was the game and that I needed to try another. I told her this was my only game. She said then that a technician would call me back.... still waiting. It's going back to the store. A great controller, IF you have have big hands! I'm a fully grown adult male and I have small hands. While I can reach every button, I cannot reach the four face buttons without streaching my hand until it cramps, not good at all. If these buttons where placed close to the edge, iit'd be perfect. If possible, try before you buy. As long as you download the latest software at Gravis.com, one should zero problems with it. Other then the size problem, it's an very comfortable game pad. It is a VERY good pad! I cannot really understand why one of the previous reviewers had those problems. With the Gamepad comes an installation program (Version 4.3a) and after installing you have a whole bunch of options to choose from to setup your controller. Once you figured out how to set it up right (very good manual), the controller works flawlessly in all my games without any problems. Both analog and digital controls are usable. The buttons are good to reach and the handling is better than every other controller i had before. I changed from a MS Sidewinder Pro Gamepad to this one because my thumbs hurt after only a couple of minutes playing with the MS Product. This is much better. Very ergonomic! I cannot give 5 stars though, because the "Aftershock" feature is not impressive, but i really couldn't care less about this. Trash, like all Gravis pads. D-pad registers up and down and that's it. CD in the box won't run on winxp, you have to download a different version of their clunky software so you can map buttons to keyboard keys, which won't work in-game anyway. Returning it tomorrow. Well I'm on my second one now and I've given up. The D-pad has not worked correctly on either. If you don't mind that and you like spending excessive amounts of time learning their retarded software this is the controller for you. Junk. Good pad, could use better software. I've had this pad for about 2 weeks now. I ignored the bad reviews below because I've used gravis products before. The manual for this is somewhat lacking, which I think is the reason for the bad reviews. The pad didn't ship with windows xp software, so I had to download it from the gravis website...which made me a bit aprehensive. But after downloading the new software (the pad WILL NOT work without it) it's working just fine. The program can be a little confusing at first, but it's actually pretty simple. Look at this controller... it looks just like a Playstation controller! The only problem with that is that I don't think you can play Playstation games on your computer, at least not legally... Fortunately, you can play Super Nintendo games using a simple emulator like ZSNES, and it's perfectly legal, provided you own the games you're playing. But no console-based video game can ever be fully appreciated without a gamepad. The Gamepad Pro is the perfect solution to this problem. If you are accustomed to playing the SNES, you will feel right at home with this controller. The 4 primary buttons (A, B, X and Y) are in the same place as on the original. So are the L and R buttons, only there are two additional buttons on top of the pad--these are useful for "turbo" functions, if your emulator has them available. 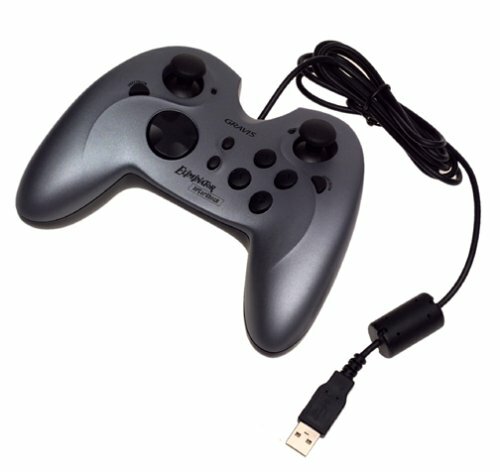 A word of warning: do not buy this controller for 3D games! Although there is a joystick (more of a thumbstick, really) attachment included with the package, the Gamepad Pro is not meant for games like Descent or the like. For such games the Eliminator, also by Gravis, is a much better choice because it is an analogue controller. But for your standard retro-SNES games (Super PunchOut!! !, Final Fight, Mario Kart, etc. ), the Gamepad Pro is the way to go. 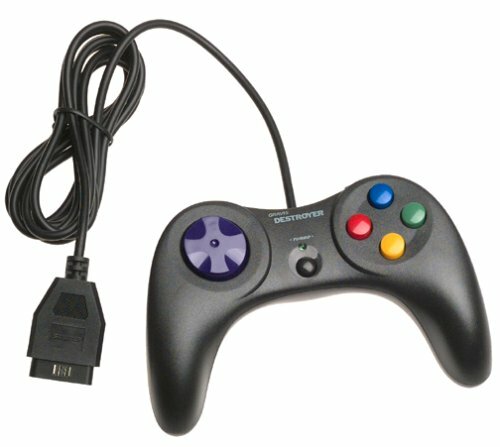 If you're not into SNES emulation, this controller is also good for PC platform games like Jazz Jackrabbit (remember that game?). Basically, any game that requires the use of a digital gamepad should be played with a controller like this one. It's got everything you need for a very reasonable price. On my visit to the computer store, where I planned to buy one, I looked at others. Others had styling, cool technology, and the price was almost $20 more! I found the Gravis and bought it anyway. It has great quality from a company I trust. What more do you want in a gamepad? Many people say that the cords will bother you when playing but it doesn't. Actually, sometimes I feel like it is the wireless Logitech one that they were selling for $50. I play NBA Live 2003 with it, and it works fine. The detachable joystick handle makes the directional pad feel like a joystick with the extra buttons. It has 10 action buttons and each one works fine. Usually, games will pick out about 2 gamepads or joysticks you can buy (popular, big brand names, found in almost every computer store), which my NBA Live did, but if it doesn't, it will probably work for any EA Sports game. Have fun.. at least I hope you do. If you have Windows XP, you just attach the USB thing into the slot and it installs within the minute. Then go to your EaSports game (if you have one) and click on 'Options', Game Controllers and pick the Gamepad pro. It is fun, if you know how to use it, and very effective. More effective than the joysticks and PS2.... so now you have your very own game console (computer with gamepad), just not a two player. Recently I aquired a good deal of older computer games. This sounds like a very good thing. but there's a huge problem - I was forced to control these games with a keyboard. And as you may know, playing video games with a keyboard is nightmarish. I needed a controller. So, I purchased this one. How well does it work? Read on and find out. -The controller is, rather obviously, modelled after the Playstation controller. In my opinion the PSX has the best controller of any gaming console, so they picked a good one to copy. 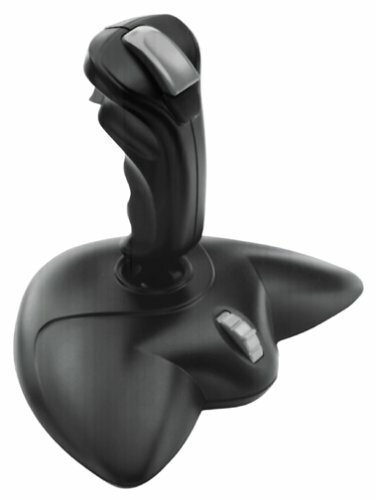 -There is a detachable joystick that attaches into the center of the directional control pad. -The cord is quite long, so you'll never have to worry about having too little of it. 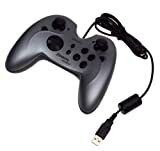 -This is about as good a controller as you can get in the $15-$20 range. -The directional control pad was done rather poorly. Because the pad itself has the diagonal directions on it, I can end up being forced into veering off course in my games. The detachable joystick helps correct this problem somewhat, but not entirely. -Getting the joystick in the hole can be a pain. -The cord is TOO LONG! Honestly, do you know anyone that sits THAT far back from their computer? I didn't think so. Overall this is a good gaming pad if you're not willing to spend too much. I personally recommend shelling out the extra cash and getting a higher quality model, but this one will work if you're on a budget. This is an inexpensive, lightweight PS2-style programmable gamepad that would otherwise be a great value were it not for the extremely shoddy directional pad. I own two of these gamepads for about 3 years (which shows its durable) and they have fared well for emulator games and games such as Madden and High Heat Baseball where precise directional control is not crucial. But the d-pad makes this almost unusable for 3D and racing games. The d-pad is slotted to the diagonals which tends to push you diagonally when you want to go up, down, left, or right. This makes it difficult to go in a straight line which can kill you in certain games where accuracy and speed are important. Using the mini-joystick can help control a little better. The controller is kinda small so it may not fit well in big hands. Its instant and easy setup without any software makes it a true plug-n-play device. For the $10-$15 price range you can't beat this, but do yourself a favor and spend another $5 to $10 more if you can for a better quality gamepad with ergonomic controls, trigger buttons, and force feedback. The reviewer directly below this review incorrectly states that the gamepad can only do 4-way directional instead of 8-way. When in fact it does both. 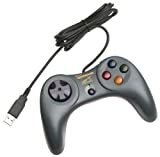 The software for this gamepad allows you to configure both the d-pad and the analog stick to work as an 8-way or 4-way. If anyone from Gravis is reading this, please hear me out!! The Xterminator Digital is one cool gamepad. It could be slightly more ergonomic, but is really no less so than most gamepads on the market. 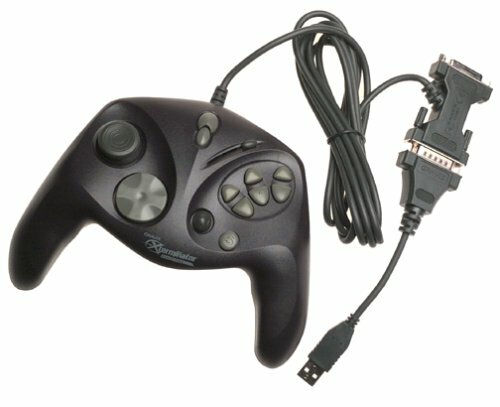 The gamepad has more buttons and controls than any other gamepad I've ever seen and can be used to control anything from an arcade hockey game to a flight simulator. It's a shame, then, that Gravis can't support it with usable software. The software is plain bad: It has a skin that doesn't fit within a 640x480 resolution screen, so if you happen to want to use it on a kiddy computer, you're out of luck. The skin is a memory hog. The control program itself runs sporadically; sometimes it will support your programmed commands within a game and sometimes it won't. The installation instructions are useless and it is a trial-and-error process to get the software to work at all. Plus, Gravis is terrible about providing updates. The original software was incompatable with DirectX 7 and it was months before a fix was available. The latest software seems to work with DirectX 8, but is still a memory hog. I've given up on Gravis and am currently looking for another gamepad. I have be thourghly impressed with this gamepad. It works with ANY game because it comes with keyboard emulation software which allows you to program each and every button on a gamepad to any key or combination of keys on the keyboard. This allows to you to use the pad with virtually any game that you may have. This saves a lot of headache because you don't have to waste time trying to configure your pad in the game...(ie. MS) to work with a particular game. The updated Gravis Xperience software is outstanding, it loads very fast and it allows you to create gamesets on your game pad(s) to any game that you have on your computer. It even has a fairly large list of gamesets already made for you. There is also a window in the user interface that displays the picture of all gravis controllers that you have on your computer. And there is a also a larger diagram of your controller that lists every button you can program. For example on mine I have my two game pad pros (one black and one white), Xterminator Dual Shock, and of course the Xterminator Digital Game pad. And guess what? the interface actually shows the two game pad pros in their right colors!! This may seem like a minute detail, but trust me its real refreshing that there are still companies out that pay attention to every detail and try their hardest to release software with a little bugs as possible. Programming a gameset to your gamepad is as simple as point and click, everything is very detailed and it is almost impossible to not know what you are doing. Just click on the picture of the game pad you want to program, then click on each button to program a keyboard key to it. Of course you still can use the game pad as a joystick, but I perfer setting it up the way I want it set up and im sure you would agree. 1) the Xperience software that comes in the box is out of date and it is VERY difficult to get it to work in all of your games. However, gravis does have the most current version on their website which is available for free download. The newer version is much better and I haven't had any problems since downloading it. 2) This is my third replacement pad because the first two seemed to develop shorts in the wires which causes Windows not to be able to recognize the controller correctly. I haven't had any problems since then so I guess I must have gotten a couple of defective ones. 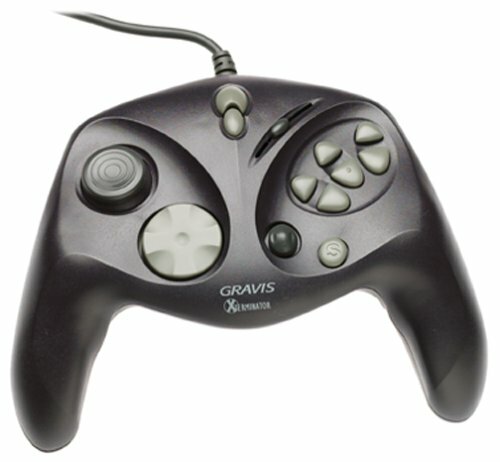 conclusion: gravis in my opinion make the best controllers out there by far. No-one even comes close in the ease of use, the power it gives you and compatibility with virtually all of your games. Their software is awesome!! It was very user friendly and was developed very well. Other game pad manufactuers should take a hint from Gravis and release quality products for a change. My other 3 game pads are also Gravis and as long as Gravis continues to make excellent products, I will continue to buy from them and only them. 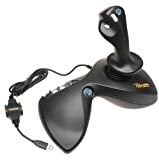 The digital version of Gravis's popular Blackhawk joystick is an excellent all-around peripheral at a decent price. With a variety of preprogrammed key sets as well as the easy-to-use Gravis Xperience software for personalizing the stick with your favorite games, it's a solid combat and racing joystick. 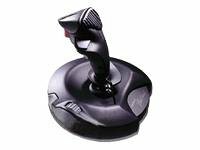 The Blackhawk Digital contains five action buttons as well as an eight-way POV hat switch for superb twitch control and a rotary throttle controlled by your left hand. It also features a pass-through game port, allowing you to connect more than one device for head-to-head gaming. The digital technology allows for greater accuracy and easier calibration during setup. 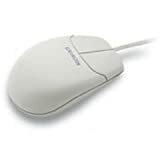 The heavy, round base provides adequate support, and the molded plastic handgrip is comfortable. Even with a thick base, the entire unit is rather compact and won't take up much desk space. We especially liked the feel during flight sims, where we could almost fly one-handed, with the solid base and the nice stick spring-back adding support. In addition to containing the drivers for the Blackhawk, the enclosed CD-ROM includes Gravis Xperience software, which lets users create their own personalized key sets for games. Gravis provides a couple dozen preprogrammed key sets for games such as Sega Rally, Microsoft Flight Simulator 2000, and Air Warrior II, and it's simple to import these as well as create new ones. 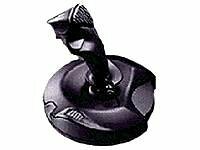 The blackhawk is a great joystick in terms of buttons. It is a little hard to program but it has great features. The movment is choppy but is okay for the price. It works with most games and really helps you play them. It doesn't have all the features of those big sticks you see out there, but it has everything you need for most games: four action buttons, a hat, and a throttle wheel. Plus it takes up less space on your desktop and it's easy to use regardless of the size of your hands. The only thing is that it's light so you have to hold it with both hands. Best Joystick I Ever Bought. 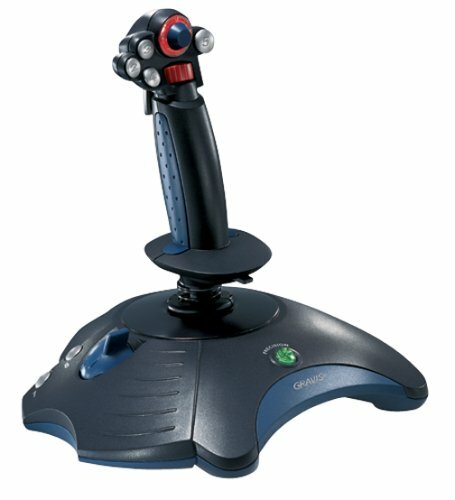 I have gone through a number of joysticks over the years and this is the best for the money. It is very durable. The buttons are easy to use and can be configured in most games. I really like the fact that I have had this product for 3 years without breaking it or having "drifting" or alingment problems. My only problem is I could not get this to work on Windows 2000, but it works great with WIN98!!!! The Blackhawk joysticks are the most comfortable sticks in a persons' hand. The right-side of the joystick has a molded piece of plastic that cradles your hand. All the other sticks have some sort of hand support but the Blackhawk has the best. You may want your fancy buttons and triggers but the question you must ask is "Do I want fancy buttons and hand cramping or do i want a joystick that feels like it's made for my hand?" Go Gravis Blackhawk!!! All I can say is wow, just, wow. When I bought this controller at my local store I was looking for something cheap and that would just get me by so I could occasionally play fighting games on my computer. My friend told me to get a Sidewinder Plug&Play USB but I was a bit skeptical of the reviews on this site. I saw that there was one sidewinder left when I got there so I decided to buy it. but my brother also wanted one and I wanted to get a second one for when friends come over etc. as well. The only problem was there was only one sidewinder left but I saw a bunch of gravis Destroyer Tilts near the Sidewinder. I figured I'd tried all the other game pads which either felt too stiff or were waayyy out of my price range, so I decided what the heck and bought it. I now throughoughly enjoy the use fo my Destroyer Tilt and use it more often than my sidewinder. I personally find it has a better response than my Sidewinder when playing fighting games and has a crisper feel to it (not to mention the cool tilt force sensing function!). The only minor qualm I had was the way to stiff D-Pad, my thumb gets tired after overuse of the controller and furthermore, the D-pad's up trigger is way to close to the up-left trigger sensing. Aslo while the tilt rocks, it can be tiring as the arm movements have to be slightly over exaggerated at times. Besides that this controller is great and hope it lasts. Trust me, you WILL NOT be dissapointed especially for it's price (I got it a tad bit lower though). I've also put a list of pros and cons to summarize this controller. With tilt enabled (LED on), the directional pad behaves as a "coolie hat", and tilting the controller behaves as analog X and Y axes. "Analog" meaning it's NOT just four mercury switches that are activated when you tilt them (like some older "tilt" controllers I've tried). This makes it well-suited for driving games. If you use the Y axes for gas/brakes, your arms will get tired from keeping it tilted forward most of the time, BUT... if you use *buttons* for gas/brake instead, you can keep it tilted back at a comfortable angle, and rotate the controller in midair to steer with analog precision. MUCH better than "tapping" around those long slow corners. With the tilt feature toggled off, it behaves as a traditional 8-direction digital pad with 6 buttons. yep thats what i used it for. first person shooter game on the internet is what i used my eliminator pro for. I have been using them for nealy 5-6 years now maybe more. I must say comapred to your 5 button or less, funky vibrating throbing super sticks which are out there, this is the real deal it rocked totally. The plain simple design the grip and overall controll I had was totally awsome. The durabilty yes is a slight problem even a experienced gamer like myself only ever got 3 months from one BUT, thats where the 3 year parts replacment warranty kicked in for me and over 3 years i replaced maybe 6-8 joysticks free. In closing the design of this joystick is totally awsome it does have some durability issues. Its not meant for aggrevise peeps who have the sensetivity set so low they feel like they have to rip the joystik off to move. maybe gravis will make a metal one with the same design seeing im soooo sad now its discounted sale and i belive when stocks run out there will be no uber designed joystick for me. I am amazed. I've been through many joysticks in my day, but tonight I had the pleasure of a new experience. As I sped through GTA the handle snapped off in my hand. I'm grateful I bought it used and it was relatively good while I had it, but that whole breaking in two makes you wonder about Gravis. It looks like they don't sell many joysticks anymore...maybe this is why. Invest your money elsewhere unless you can get it cheap and treat it like a newborn. It happened to me too. The handle broke right off. Odds don't look to good for this product. Wish I'd read these reviews BEFORE I bought mine. My 6 year old kid was playing with this and the joystick broke right off. He's pretty small and not using much force. I agree with others - this unit may be inexpensive to buy but doesn't last long. Worst Joystick I have ever owned!!!!!!!!!!! Different games used to require different controllers. Not anymore. With the Gravis Xterminator Digital Game Pad, you get the performance of a standard game pad plus the joysticklike power of a proportional D-pad, 48 programmable functions, and USB support all in one compact controller. The Gravis Xterminator Digital Game Pad lets you navigate 3-D worlds with fluid, joysticklike control and 360 degrees of movement.Other features include two proportional flippers to fire, roll, strafe, or control speed as well as a proportional throttle for flight and driving games. You get precise acceleration and deceleration control.With the Gravis Xterminator Digital Game Pad, you can modify altitude or direction on the fly, change perspective or weapons with an eight-way point of view, and get twice the functionality using the HotSet switch. 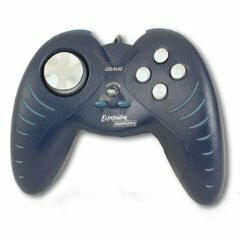 This game pad supports both USB and standard game ports and works with both PC and Macintosh platforms.It comes with Gravis Xperience software, enabling you to customize cheat codes, massive action sequences, and up to 48 functions (works with PCs only). This is a ok joystick. I wouldn't say it was awsome, though. It is definitely not awsome. It feels cheap and it is all plastic. It is very light, and that's not good because the whole thing will tilt sometimes when i move the stick left or right. The small rubber pads on the bottum don't help keep the joystick in one place very well. The spring that holds the stick in a centralized location is very loose and it is too easy to move the stick around. That's why it feels cheap. All of the games that I have don't support the rumble feature, so I don't know how well the rumble works. This is overpriced and should be around $15 or $20. If it was $15 I'd say it was a good buy. It works, but there are many much better sticks for around the same price. Get some other joystick. I bought this joystick in the hope a a ok joy stick, and guess what i got. An AWESOME JOYSTICK!!!!!!!!!!!!!!!!!!!!!!!!!!!!! it was the best joystick i have ever gotten (out of the 7 i have). I definatly recomend it!! The Stinger has a great feel, was very easy to install (for a technical person like me). The ten buttons work well, and it has powerful software included. With the Exterminator software, it can emulate almost any kind of joystick or even a mouse, and all the buttons are programmable to any combination of keys. The ultimate controller for games, as Gravis pulls through with a great companion to every game! Bought this stick on strenght of reviews elsewhere. The stick worked well initially, however, it obvious that the reviews I read did not test long term reliability. After a couple of weeks of light usage, guess what, the twist handle rudder function broke. Have emailed technical support and await a response. Hoping it is still under warranty so I can get my money back. I've had lots of problems with it too. I also have had two, I'm on the second right now. It worked fine at first, then the rudder control... ermm.. "freezes" in one position.. not physically.. but whenever you go into a game, the rudder is constantly "pulled" one way.. only way to fix it is to disable it in the game.. I played like that with the first one for a while, then it broke.. I mean the stick broke off the rest.. kind of annoying. The same rudder problem has just started occuring on my new one now. I wouldn't recommend this to anyone. I have had two of these controllers, and both have failed in the same fashion. Support is non-existant unless you make the toll call to this company on their time, 9-5 EST. The handle twist function breaks for no apparrent reason. I only got an answer after making a long-distance call to their support center. No response from their support page. Problem is, when it works, it works very well. You need to download a beta patch if you run Win XP, but that worked great! Again, it's a problem with their hardware. So, beware. It will work just fine...for a little while. I guess I'm going to buy a more reliable stick. Once is a fluke, twice is a problem, and I'm not willing to see what happens on the third try. This joystick is terrible. I bought it primarily for Fighter Ace II and so far I have gone through 2 and the the third is in the mail. Apparently they have some sort of design problem where the rudder control actually breaks! This is not a software issue. While Gravis' customer service has been very happy to keep sending me replacements, enough is enough. I would highly recommend purchasing another controller. I picked up this gamepad because of the low price, and let me tell you: it's not worth the money no matter how cheap you can get it. What good is a gamepad if you can't make a player in EA Sports's FIFA 2003 run in a straight line? My soccer players looks like they smoked up, shot some drugs, and then blindfolded themselves before taking the field. It's actually rather amusing, but for all the wrong reasons. Stay away from this pad, unless you get a masochistic high out of wearing the skin off your left thumb while trying to make sensical moves that are only sporadically rewarded with the proper outcome. I'm giving it one star only because this review system won't allow me to give it less. I just wanted a nice cheap gamepad to play emulator games with. I don't need the rumbling, the analog controls; just something simple. This device is terrible. The two buttons on the top are just rapid fire buttons for two of the colored ones. The directional pad is completly out of wack; it takes all kinds of Zen meditation to guide a character in a straight line. Save your money. Do not buy this. I was like you once. This is the cheapest PC gaming controller on the market. It's easy to use, and it works. In 1990 we thought the even less equipped two button nintendo game pad was the best thing since sliced bread. Let's not get greedy for 9 bucks. If you want a good controller for occassional gaming, go for this one. I have it, and I love it. It took me 3 trips to COMPUSA for it to finally be in stock, so apparently I'm not the only one. Enjoy. Bought it, Use it, Like it. My last gamepad broke. Most of the newer gamepads don't always work with older DOS programs. This one worked exactly as I hoped it would. Better get 'em while they last. 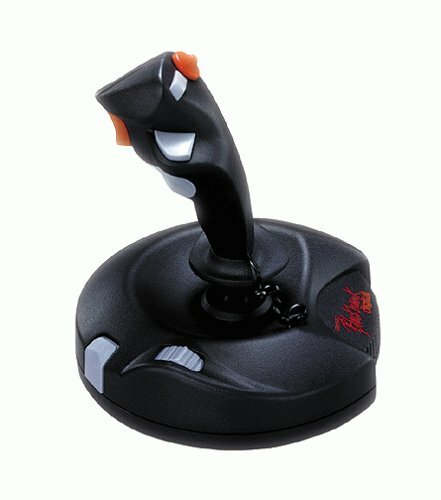 This is a very good joystick I have owned it for about a year now it's great. I've only have one problem with it, after about six mounths of usage the second button stopped working. but its still a great stick it gives you alot of control over the situation. I would only recomend this to the heavy gamers out there its not ment for newbies who don't know how to use and maintain a joystick. 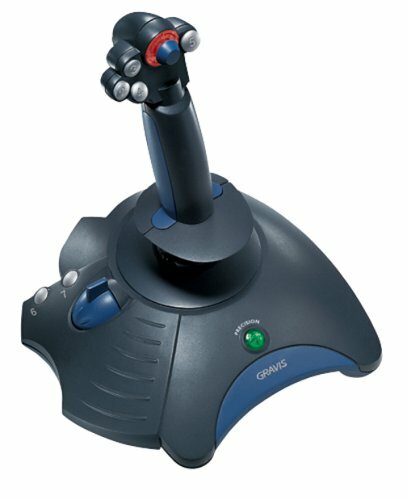 I have tried two of Gravis' joysticks. This one did not work any better than their cheaper one. After installing, it did not work as advertised. When I tried to get support, it took a week to get a response. Their response did not solve the problem. My impression was that they did not really care. I guess they sell enough of them, that one (or two) customers lost, does not matter. I will give joystick away if I can find a friend who wants it. This is a real good joystick, however, it locks-up sometimes. During a game like Combat Flight Simulator, you can move your joystick but the game doesn't read the movements. You are basically stuck going the same direction. It is real good for racing but not for simulator flying games. You get what you pay for. This is very easy to install as the drivers are inside the stick so its very easy to install. It then works for about 3-5 minutes before getting hosed up to the point where you cannot move. Makes a nice paper-weight. I got this joystick for X-mas, and I loved it. It was really comfortable. But then I was racing with it, not doing any hard turns or anything like that, and I hear this "Snap!" And then it gets all loose. I asked my brother and he said a spring had broken. And I wasn't even doing any thing rough with it! Kind of strange. Maybe I should have rated it less, becuase it doesn't have a hat, can't twist and only has 4 buttons (plus the little precision button). Not to mention the fact that it's a piece of junk now, it won't work any more. OK, I guess maybe I just got a defective one, but still, I would buy something of better quality. 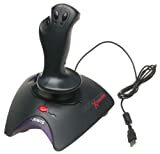 Altho this joystick is made by gravis it is one of the company's low end/low price items, and not worth the money unless you use it for kindeling. All in all this joystick is a piece of garbage to be hammered apon!